Today’s episode of Yeh Rishta Kya Kehlata Hai starts with Kartik (Mohsin Khan) encouraging Naira (Shivangi Joshi) that she can do it and she should not be afraid of anything. There Gayu is not feeling well, Rama brings some lemon juice for her, she feels better. Devyani tells her that we should enjoy life and that when the family is together then she should always be happy (Mari panri gulab kha phool track is played in the background), all pamper Gayu. There Suhasini is worried as to why did Naira agreed to help Purushottama as a lot of work is there in the house as marriage is there, Mansi also is tensed as why Naira agreed to work with Purushottam. There Naira feels scared to show her presentation to all. Kartik also prays for Naira’s presentation. All clap for Naira as they all like her presentation, Kartik comes and hugs her and congratulate her. Samar tells Kartik that one urgent meeting is there and they have to go, Purushottam also tells that they also have to go to show the presentation and he wants Naira to come with him and get the approval and that they will come back soon. Naira objects as she wants to be present here, as a lot of work is there but Kartik tells her to go and he will take care here. Mansi is tensed seeing Naira go with Purushottam. Meanwhile, as Purushottam and Naira are going, she feels uncomfortable with him. Purushottam tells that the presentation is cancelled and tells that they should celebrate it by eating ice-cream. Purushottam asks about her and her likes. Naira gets Kartik’s message as his meeting is also cancelled. Naira doubts Purushottam’s intention. There Mansi is trying to call Naira to make her alert. Naira tells Purushottam that she wants to eat her medicine as she is not feeling well. When they reach home, Naira shouts at Purushottam as he is a bad guy and how dare he wanted to do this to her. Naira tells that she will tell Kartik what all he did with her and shouts at him as to how dare he touched her. Ella comes there and shouts at Naira as why she is shouting at him. Naira tells that she does not know what her father has done. But Ella is not ready to take any bad words against her father. 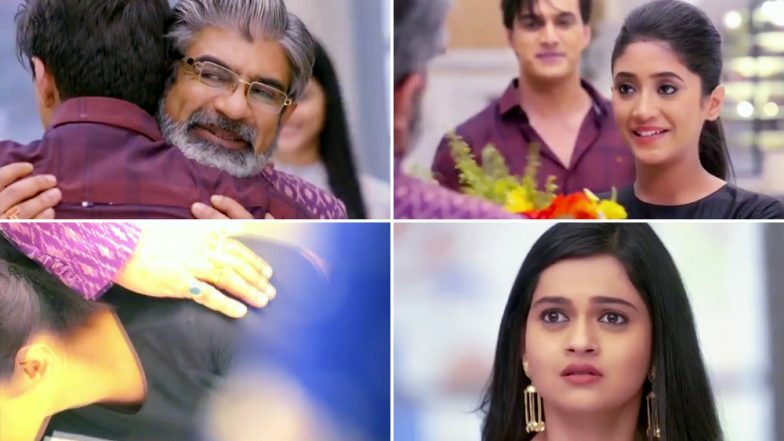 In the precap, Purushottam tells Naira that she is wasting her time as Kartik will never believe what she will tell him, Naira says that he should worry about himself and not her.